DigiPro2 is distributed as a trial version. The trial version starts with advanced features enabled for 45 days. After 45 days, the advanced features are disabled and only basic features remain. DigiPro2 “basic” is free to use and still provides database management and simple plotting. 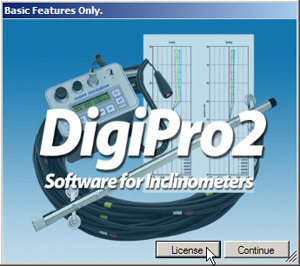 DigiPro2 basic can be converted to “advanced” at any time by entering a valid license key code. License key codes must be purchased. Contact DGSI or a distributor to purchase license key codes. At the time of purchase, we enter information into our license server to generate the key codes. Then we email the key codes to you. If you purchased keys through a distributor, we typically email them to the distributor. The steps below tell how to enter a key code and how to manage keys. Step1: Start DigiPro2 and click the License button. DigiPro2 then displays the license dialog. Step 2: Cut and paste the key code from your email into the License Key field. Then click “Install. Step 3: DigiPro2 validates the key code via the internet.When the validation succeeds, you can see “License Installed” in the license status field. Check that you have the original license key that was emailed to you. Start DigiPro2 on the old computer. Click License -> Uninstall License -> Yes. DigiPro2 on this computer now reverts to the basic version. Install DigiPro2 on your new computer. Then follow instructions here. The most common reason for this error: the key has been used too many times.Contact DGSI or your distributor to correct the situation. This message appears when DigiPro2 cannot access the authentication server. If you see this message, please try the manual authentication method, as explained below. If you see the authentication error message above, click Yes to create a license file. The Save As dialog appears. Specify a path and name for the license file. We recommend that you change the default filename (license.lic) to a name that you can associate with this computer. This is especially important if you must generate a number of license files. Click “Browse” and locate the license file you just saved. Click “Authenticate”. A new, authenticated license file will be downloaded. Save the file onto the computer with DigiPro2. Start DigiPro2 and click License. If you do not have permissions to download files, follow this process which offers validation by email. Click Yes to create a license file. Attach the file to an email addressed to [email protected] or to your distributor. We will return an email to you or to your distributor with “authenticated license” attached. Save the attachment onto the computer with DigiPro2.